The Peugeot car plant at Poissy began manufacturing in the 1940’s and has been building cars ever since, manufacturing more than 200,000 cars a year. The cars in the Peugeot manufacturing plant are built to a production schedule based on order intake from a dealer network spread throughout Europe. An important aspect of vehicle manufacture is to be able to deliver to a dealer network accurately and on time. 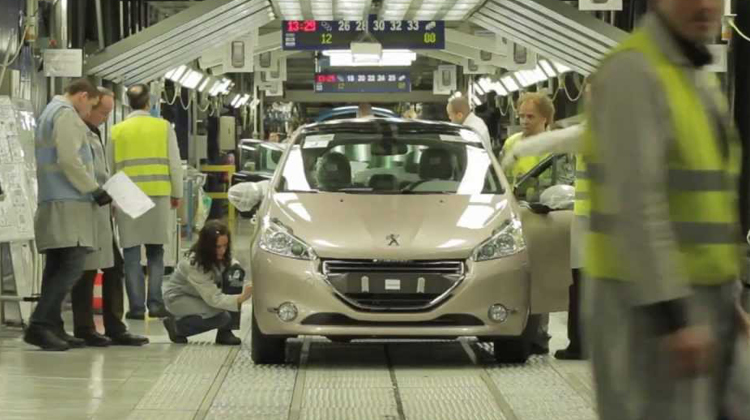 Peugeot required a production line tracking solution which would provide a cost effective and streamlined production process which would help to deliver the right cars to the dealer network on time. At the start of the production line a Eureka tag was fixed to the chassis of every car body to provide a unique ID. The tag was then used to track the complete build process of the car on a power-and-free conveyor system where a network of over 80 Eureka RF readers process data from over 2000 tags. At several points on the production line, including before and after the paint ovens, the Eureka readers were instructed, via an antenna, to read and/or write data to and from the tags. At the end of the production line tracking with all the manufacturing data sent to the systems main frame database, the tag was removed and recycled back into the production process. The Eureka active tagging system uniquely identified each car body on the production line providing accurate real time manufacturing data. This optimised scheduling, providing a cost effective and streamlined production process, helping to deliver the right cars to the dealer network on time.